Priest Shoto 勝道上人 - Shodo Shonin (see below) passed away on March 1st of 817. He was cremated in the valley of crags, which was located near the kaizan-do hall of the founder. A small and vermilion lacquered hall was built to enshrine Shoto. That shrine is today's Kaizan-doh hall. Wooden image of Bosatsu and seated image of Priest Shoto are enshrined in the Kaizan-doh hall. It is told that those images were made in the Muromachi period. Also, wooden images of ten pupils of Shoto are put on the right and left of the principal image. Rites of Kaizan ceremony are carried out in the hall on April 1st. There is Gorin-to tower 五輪塔 in the place of Shoto's tomb. Three other tombs are also put there, but these are for his followers. The Gorin-toh tower stands on the back of Kaizan-doh hall. The crag on the back of Kaizan-doh is called Hotoke-iwa, which means Buddha Crag. Rocks of the crag were like Buddha, but these collapsed during an earthquake. 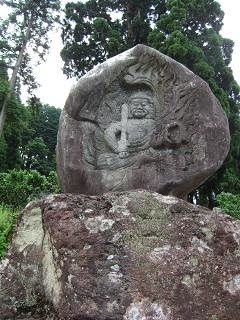 Today, 6 stone images of Buddha are put on hollow place, located on the back of Kaizan-doh hall. One of the statues is Fudo Myo-O 六部天(１体は不動明王).
. Shoodoo Shoonin 勝道上人 Shodo Shonin .
. Nikkoo Kaidoo 日光街道 Nikko Kaido Road . The author takes a walk along the road and shrines on the way. 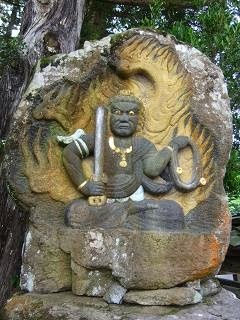 Fudo statues also in the compound of Shinto shrines. 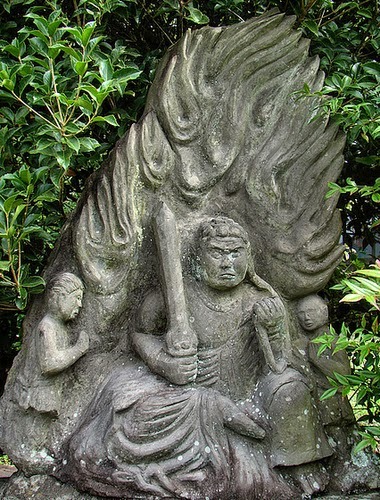 All the Fudo statues placed in shrines were offered with the wish to be protected from fire.
. Hibuse 火伏不動尊 Fudo preventing fire . CLICK for more samples of Fudo Myo-O ! This is an old stone memorial, which people call "Fudo Myo-O", but the carving from the middle of the Kamakura period is almost lost. 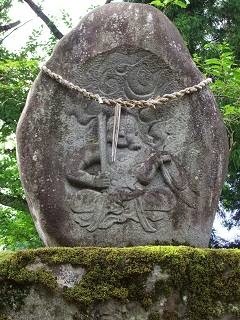 The stone is andesite 安山岩 and about 168 cm high and 76 cm at its widest place. 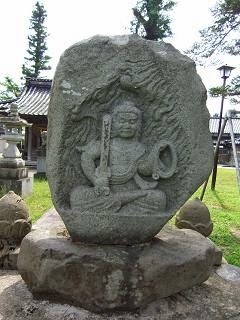 On the front is the carved figure of a seated Fudo. The figure below has been produced by fukusige, using his computer graphics facilities. Most of these cards introduce a haiku or senryu and a famous place of the town, including the relationship to the famous warlord Taira no Masakado. 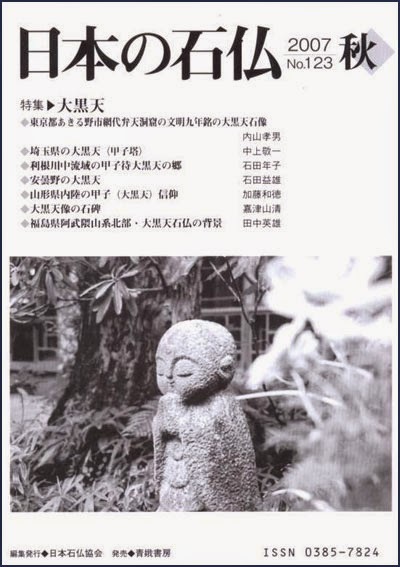 One day in July 1975, children playing in the area found a "HUMAN FACE" had appeared on a stone memorial of a Narita Fudo Myo-O stone memorial. It was the time of the O-Bon festival and the whole village got very excited about this finding. It is said to have been the face of the famous and feared warlord Taira no Masakado, who had made a prayer here to win a fight, but had his head severed by Fujiware no Hidesato 藤原秀郷 instead. Masakado appeared here to show his eternal grudge and hatred. On the same link of Moriyama town there is another card of a temple with a reference to Masakado and Fudo Myo-O. Kuyoo no mon, 九曜の紋, the family crest of nine days. The big circle represents the sun and the eight smaller ones are the days of the week from monday to sunday, the other two represent Shakyamuni Buddha and Fudo Myo-O. Masakado brought the belief in the stars to the area of Moriyama. Issa stayed at the temple Sairin-Ji　西林寺 for quite a while and they had many haiku meetings there. Back to the Fudo Stones ! CLICK for more stone memorials ! Jomo Karuta (Joomoo Karuta) 上毛かるた. 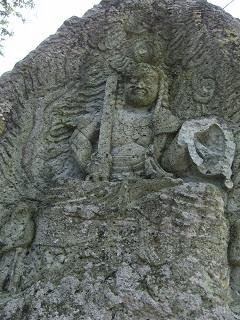 I found this carving of Fudo Myo-O on Shiraishi Island in the harbour, at a very low level close to the beach. 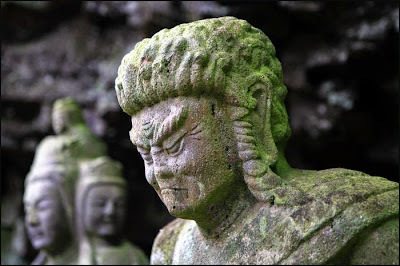 Buddhist figures chiseled out of stone, the Magaibutsu of Japan. They follow in the tradition of the greate figures along the Silk Road, from the un-famous reliefs of Bamiyan in Afganistan to Dunhuang and others in China. Magaibutsu can be found all over Japan, but maybe the most famous are in Kunisaki in Kyushu. Read the LINKs given below for more. Bunei Sekibutsu 文英様石仏 Stone Buddhas of the Bunei style . magaibutsu　磨崖仏 Also written 摩崖仏. Ch: moyafo. Also known as magai sekibutsu 磨崖石仏 or 摩崖石仏. 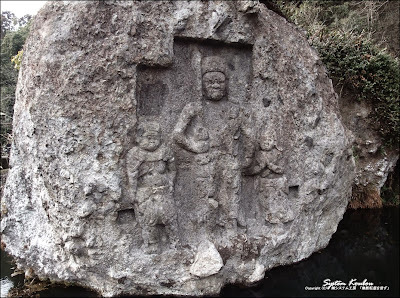 A Buddhist image carved into the surface of natural rock such as a cliff face, a large rock, or a stone cave. 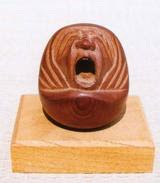 The rock-face was first polished, and then the image was created with engraved lines *senkoku 線刻 in low relief *ukibori 浮彫 or in high relief takanikubori 高肉彫. Clay was used to model details on the relief carving. Occasionally colors and gold leaf were applied. 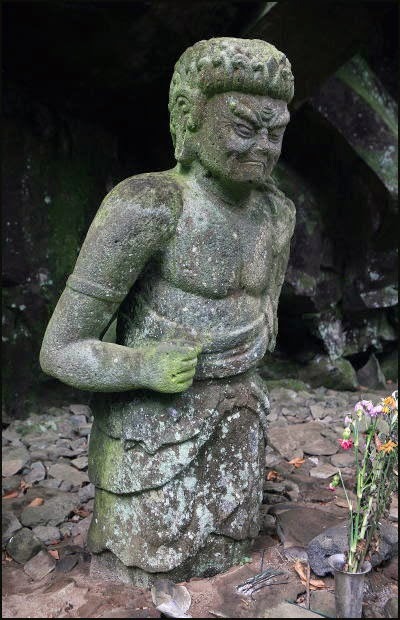 The surrounding rock was often hollowed out to form an alcove for the figure, so a deeply carved magaibutsu was sometimes known as *butsugan 仏龕, meaning Buddha alcove and a cave temple large enough for people to enter was often referred to as sekkutsu jiin 石窟寺院 or sekkutsuji 石窟寺. 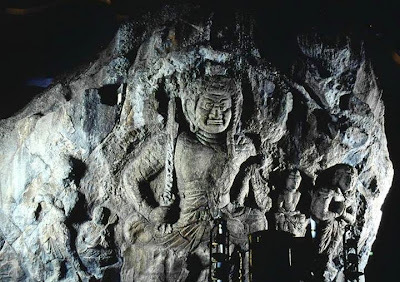 Rock carving flourished in the Han, and Northern and Southern dynasties in China as well as in India, Afghanistan, and Korea. In Japan magaibutsu never formed the mainstream of Buddhist sculpture, but there are many surviving examples dating from the 7c to 14c. 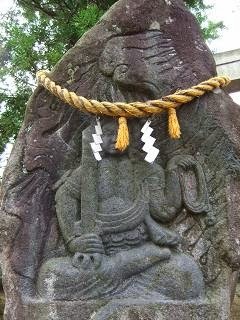 It has been pointed out that popular belief in the living spirit of rocks in Japan was combined with Buddhism and was expressed in magaibutsu. 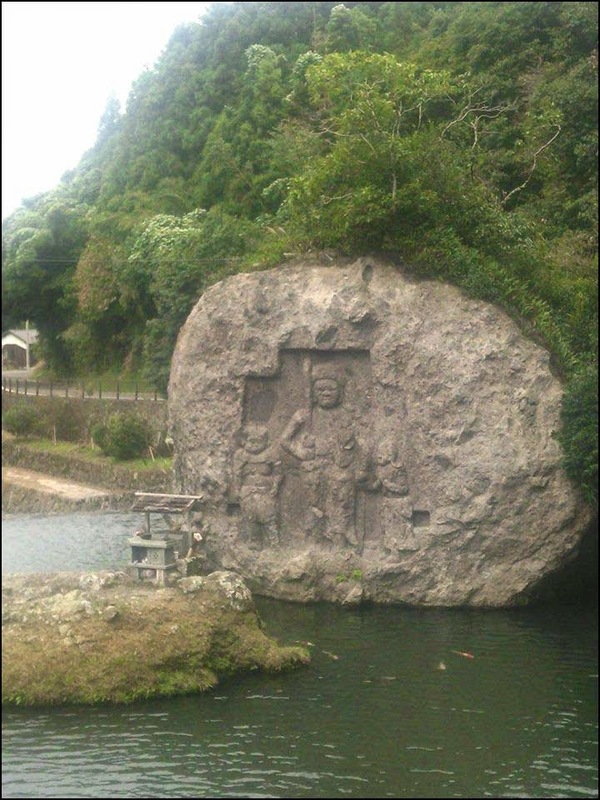 Examples can be found across the country, but Kyuushuu 九州 has the greatest concentration of rock carvings, including the famous stone Buddhas in Usuki 臼杵, Ooita prefecture (11-12c). The images were carved on soft rock such as tuff, a rock formed by the consolidation of volcanic ash and tufa, a porous calcium carbonate rock found around mineral springs. The late Heian period was regarded as the peak of the magaibutsu, in Japan and Kamakura works were smaller in size, carved on hard stone such as granite, and often unpainted, leaving the natural stone surface. After the 14c, free-standing stone Buddhas *sekibutsu 石仏 became more popular, and fewer magaibutsu were made.
. Ooiwasan Nissekiji 大岩山日石寺 . Hokuriku - 36 Fudo Temples . 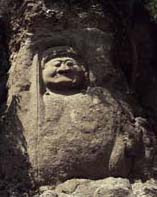 I will take this chance to tell you a little about Buddha figures chiseled out of stone, the Magaibutsu of Japan. They follow in the tradition of the greate figures along the Silk Road, from the un-famous reliefs of Bamiyan in Afganistan to Dunhuang and others in China. 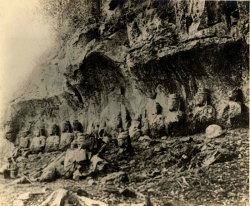 Have a look at the Bamiyan Buddha before it was destroyed. Here are some Buddhas from the oasis Dunhuang in China. Magaibutsu can be found all over Japan, but maybe the most famous are in Kunisaki 国東半島 in Kyushu. On this HP you can find a lot of information about them, sorted according to areas in Japan, with explanations and access directions.
. . . CLICK here for Photos from Kunisaki ! Twenty long years were spent by a mason from Hiji-machi Town in carving this. 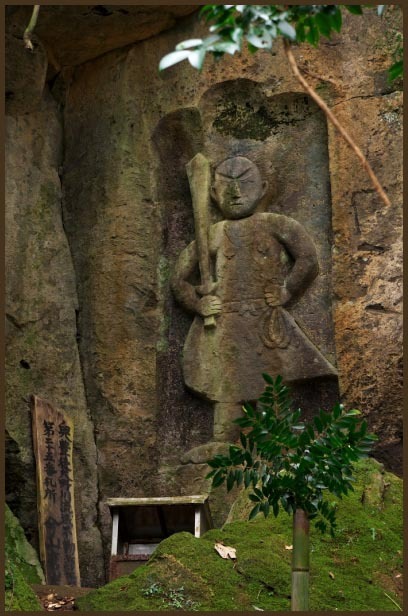 It was done at the order of the 15th chief priest during the latter half of the Edo period. 538 bodies stand close to one another on a slanting surface. 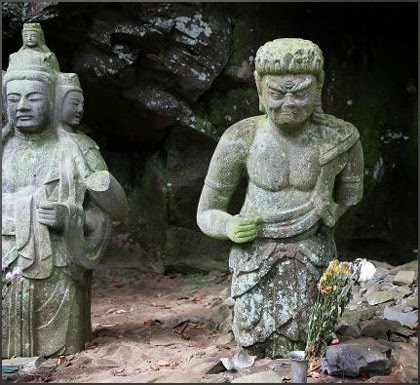 Oita has a wealth of Buddhist figures carved into mountainsides and sculpted from stone. 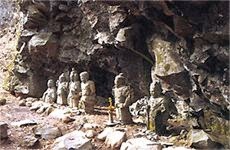 The group of 75 figures in the mountainside in the area of Usuki City (the Usuki Magaibutsu) is a National Treasure. The immense Kumano figures (Kumano Magaibutsu at Kitsuki) are also famous, and the 3,770 stone images at the Rakan-ji temple (Nakatsu) attract much attention. This area was famous for Magaibutsu since the late Heian period. 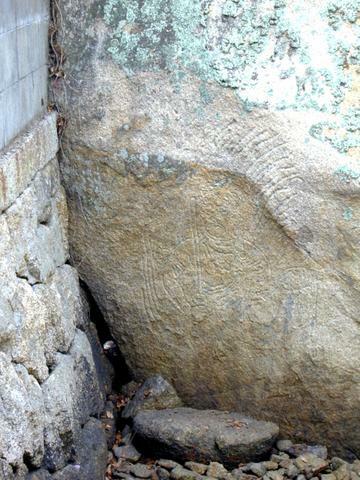 Three medallions of the Kamakura period are visible on the cliff face; they are carved with Sanscrit characters representing Fudo, Comet, and Yakushi. Two additional medallions, now weathered, represent Eclipse and Bishamon. The combination of deities has astronomical and astrological and protective significance, in keeping with the esoteric Buddhist (Tendai) affiliation of the shrine. Buddha figures of various periods are carved near the base of the cliff. The Kunisaki Peninsular in Oita Prefecture, northern Kyushu, was a major center of Shugendo, the syncretic mountain religion mixing elements of esoteric Buddhism, Daoism, and other forms of mountain "religions". 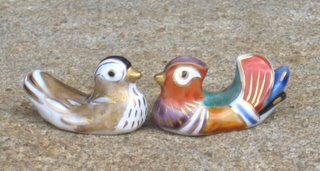 The version practised in Kunisaki was a variant based on Tendai and Hachiman. 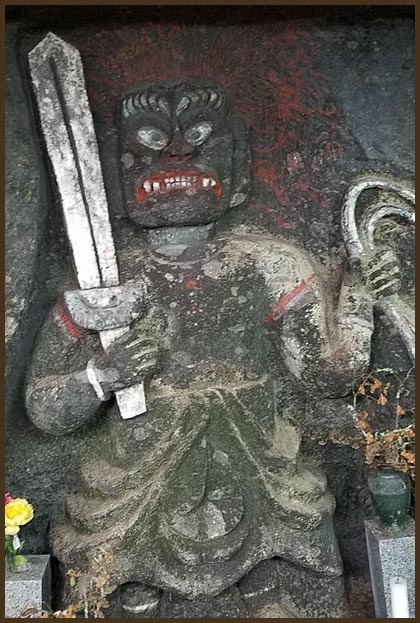 Though details differ, most statues of Fudo Myo have him holding a sword in his right hand, a rope in his left, and flames behind.
. Jusanbutsu 十三仏 13 Protector Buddhas . 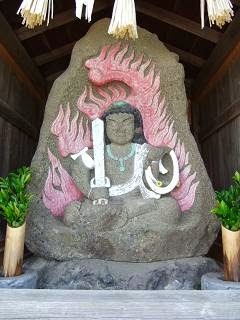 Have a look at this beautiful Jizoo Bosatsu of stone. The Big Yakushi Buddha at the Nihon-ji Temple in Nokogiriyama, Chiba Prefecture. He is 31 meters high. This temple is easily reached from Tokyo by ferryboat from Kurihama to Kanaya and then up the Nokogiri mountain by cablecar. The whole area with its many stone statues is well worth a daytrip.
. Murakami Kijoo 村上鬼城 Murakami Kijo . This one is about 8 meters high and the largest in Japan. Click thumbnails for more photos ! 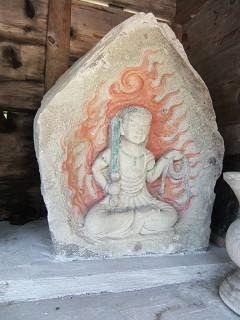 at Temple Fuko-Ji (Fukoo-Ji 普光寺), Urasa 浦佐, Niigata pref. 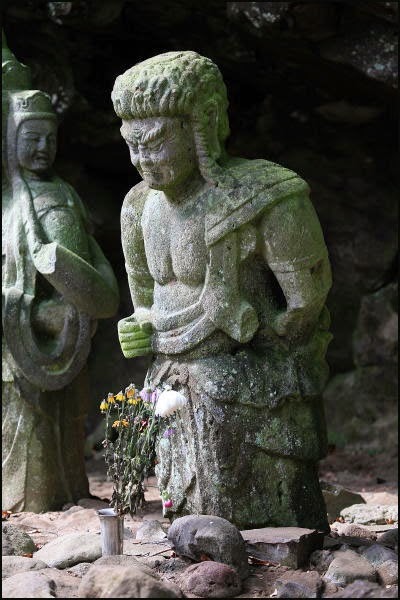 Also a Naked Festival of this temple.
. Tomikawa Magaibutsu 富川磨崖仏 Tomikawa Cliff Buddha . mimidare Fudo 耳だれ不動 "Fudo with hanging earlobes". Iwa no Mi (岩の身) "Body of Rock"
This teaching was made famous by the legendary Miyamoto Musashi. It describes a warrior who remains calm and imperturbable in all circumstances. There is a famous story regarding this saying. It seems that this saying became very famous in Japan, and naturally people became interesting as to what Musashi actually meant by "Iwa no Mi". So it happened that one day a lord came to call upon Musashi and inquire what his teaching actually meant? Musashi immediately summoned one of his deshi, Terao Ryuma Suke, and ordered him to commit seppuka instantly. The deshi instantly dropped to his knees, opened his kimono exposing his midsection, drew out his wakizashi and without hesitation began to thrust the blade into his belly. Musashi rapidly reached down and grasped his student's arm stopping him at the last second from carrying out his command of suicide. Musashi then looked at his quest and replied "This is the body of a rock". The lord took several steps back, bowed several times, and scurried on his way. Historically, this story is actually recorded in the "Terao Ka Ki" 寺尾家記 the chronicle of the house of Terao.